A week ago, I stopped receiving email notifications. HELP! Hi, a week ago all email notifications from Jotform stopped arriving in my email inbox (hosted by gmail). This is a big problem because new clients booking online through my reservation form (hosted by Jotform) and I normally am notified. Hoping to fix this issue, I logged onto Jotform and changed the email to receive notifications. This did not fix the problem. I had a new client fill out my Jotform today and I did not receive an email. Nothing has changed on our end of things - we were receiving notifications normally up until 7+ days ago. I went into my resevation form's SETUP AND EMBED settings and sent a "TEST" email to myself. It never arrived in my inbox. The form having problems is called "ILD: Lighting Event Reservation Form". All of the other forms are working correctly and sending notifications. Can you please change the Sender Email of the notification to noreply@jotform.com and check if a test submission works properly? I did this and still did not receive an email. I dont see the change having been made on the form. I just changed the setting again. Saved the changes. Sent a test email. 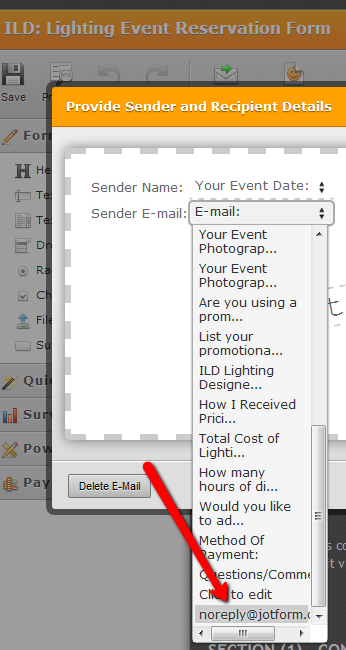 No email received at events@ildlighting.com yet. I'm going to have our IT dept look at our email server on Tuesday when our office re-opens. Thank you for your prompt responses. Happy Super Bowl Sunday! You can ask them where the message which was given an id of 'q15N5B38008854' by your mail server went to.